Abstract : In this paper we address the problem of establishing a computational model for visual attention using cooperation between two cameras. More specifically we wish to maintain a visual event within the field of view of a rotating and zooming camera through the understanding and modelling of the em geometric and kinematic coupling between a static camera and an active camera. 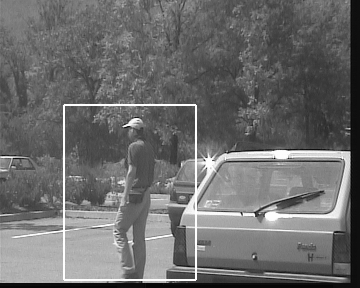 The static camera has a wide field of view thus allowing panoramic surveillance at low resolution. High-resolution details may be captured by a second camera, provided that it looks in the right direction. We derive an algebraic formulation for the coupling between the two cameras and we specify the practical conditions yielding a unique solution. We describe a method for separating a foreground event (such as a moving object) from its background while the camera rotates. 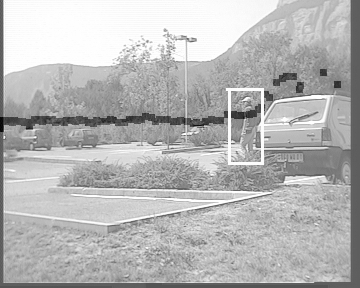 A set of outdoor experiments shows the two-camera system in operation.